Rochester, NY – 08/31/2018 - DuraMark Technologies near Indianapolis, IN is focused on durable labels. In fact, their logo itself is cleverly a warning label. When they had a chance to look at replacing a press at their new facility, they looked to Durst. 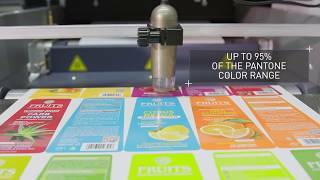 With its proprietary single pass UV inkjet technology, Durst provides the required flexibility to produce fast, efficient and with the highest print quality for the complete range of label & packaging applications. Small, medium, and now long runs are highly profitable with digital systems from Durst. The options are virtually unlimited and open up an enormous potential for new products and services in an ever-changing market. With Durst continuous innovation of the Tau 330 UV portfolio, users can now rise above the rest and ‘Configure their Digital Future’ – available as stand-alone or an entirely automated production unit with integrated conventional & digital finishing lines, or even as a hybrid configuration with multiple flexo decks. Brixen, Italy – 06/09/2018 - Digital production now accounts for more than half the business revenues at Standfast & Barracks with customers being encouraged be part of the new wave of innovation provided through Durst, manufacturer of advanced digital production technologies. Less than three years since a devastating flood closed the factory for more than four months, Standfast & Barracks continues to cement its partnership with Durst. It expects 60% of turnover to be from digital production by the start of next year. The cutting-edge technology is also helping to drive export growth that by the end of 2018 will represent 20% of sales, of which half are to the USA. Standfast & Barracks produces more than 150,000 yards of printed fabric per month. And until five years ago, this was all done by conventional printing. Turnover at £15.4 million is now back at the same levels prior to the flooding, with sales success largely down to digital print production advances. The UK fabric printing company has two Durst Alpha 190 systems, which are part of of a new generation of super high-performance multi-pass printers with the One-Step Greentex P ink. Standfast & Barracks has now trademarked its innovative direct-to-fabric Greentex pigment printed collection, Ecofast™, which is sustainable and has highest lightfastness in its class. Using the system that allows printing on almost any type of surface, Standfast & Barracks plans to formally launch the new Ecofast™ line at Heimtextil in January 2019. Durst’s technology will enable the company to open up market opportunities in areas such as contract and apparel, including outdoor and roller-blinds. Standfast & Barracks, with a heritage stretching back almost 100 years, employs 200 people and is one of the most versatile and distinctive printers in the world. It is part of the British luxury furnishings group Walter Greenbank Plc and has an international reputation for a commitment to quality, innovation and advanced technologies. A perfect example is the Durst Alpha is the Alpha 190, part of the Alpha Series that features different configurations and print widths for industrial printing of fashion garment and apparel, home textiles and upholstery. Durst developed the One-Step Greentex P ink especially for the Alpha Series. The environmentally friendly pigment and the reactive and dispersion inks are based on Durst Water Technology. 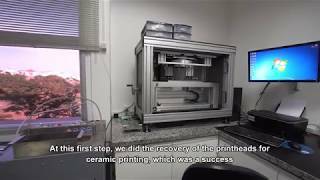 The Durst Group has implemented a Repair Center at their branch in Brazil to offer print head maintenance services for the Durst Printing Systems.Guilherme Pogianelli, Operations Manager at Durst do Brasil says, „We help our customers with cost reduction, time reduction and versatility by doing the printhead recovers at our Repair Center“. It is a renowned Italian ceramic company to win the first installation of the revolutionary Durst Full Digital Glazing, the completely digital glazing line based on an open system that ensures for the first time a full digital industrial production process. In the large Durst exhibition area at Tecnargilla, in addition to the innovative production system, it showcases numerous industrially produced tiles made by the first customer of the Durst Digital Glaze Single Pass printer. "Full Digital Glazing is the result of several years of intensive research carried out by our laboratories, also in collaboration with world-renowned external partners chosen to develop dedicated glazes and new designs", - explains Norbert von Aufschnaiter, Director of the Ceramics Printing Division at Durst - "This is the first and up to now only solution for a really true digital tile production; an exclusive technology that the market has been waiting for a long time. The announcement of the first installation gives reality to the dream of many ceramic companies, which in addition is fully responding to the standards of Industry 4.0". The heart of the Durst glazing line, the Gamma DG Single Pass printer, which uses the patented Durst Rockjet® print head technology, specifically developed by Durst to handle high viscosity water-based ceramic glazes with large particle sizes over 45 microns. A true revolution that opens up unprecedented scenarios in the development of design that cannot be achieved with traditional glazing systems and alternative digital technologies available to date. Precisely on this topic, the Durst will participate with a speech at the X. Annual ACIMAC Meeting entitled 'Ceramics 4.0: large, digital and sustainable', to be held during the event on September 25. The Rimini fair will be a truly unique event for Durst: it will also be showcasing two different systems of the Gamma XD Series, recognized as the best ceramic printer in terms of quality, nozzle stability, color consistency, absence of banding, reproduction of details, as well as very low maintenance cost and service needed. Only some of the performance advantages appreciated by Durst customers who have spontaneously released statements made with the names for the "Durst-Tecnargilla Newspaper" that will be distributed by Durst at Tecnargilla. Comments that show the great satisfaction for the performance of this digital technology as also stated by Lance Foxcroft, CEO of Ceramic Industries Limited (South Africa): "Reliability, 24/7 productivity, exceptional image quality and low maintenance costs are the main reasons that led us to focus on the Durst Gamma 108 XD systems to successfully achieve our corporate objectives". The new ultrawide Gamma 208XD printer is the first to show that, thanks to the numerous advanced features that distinguish the Gamma XD Series, adds the ability to decorate large ceramic tile sizes /slabs up to 200 cm wide. To demonstrate Durst's constant commitment to R & D, another novelty for Tecnargilla visitors: the Durst ColorGATE CMS Durst Edition color management system developed and optimized specifically for the needs and conditions in the ceramic tile production process, able to significantly reduce the number of tests normally required when repeating productions over time due to the normal changes in the process (glaze, firing conditions, etc.). Thanks to the ability to offer a quick color matching, it is ideal for re-producing the product in smaller lots over time as well as producing the same product in different production locations and/or glazing lines, responding to the current needs for warehouse stock reductions. The Durst system, which already has several installations in the world, can be implemented and operated in all ceramic factories with Durst and Non-Durst digital printers. The real-time production possibilities state-of-the-art UV inkjet single pass printing technology delivers will be demonstrated by Durst’s new Tau 330 RSC, at Labelexpo Americas, Chicago, September 25 to 27, booth 5901. Among the highlights of the system, that will engage visitors and present business winning opportunities, is its high printing resolution, unmatched printing speed and 8 color printing stations. The Tau 330 RSC is a UV inkjet label and package printing press featuring 330 mm (13 in.) print width combined with leading edge print speed of up to 78 linear meters/min (245 ft./min) at a resolution of 1200 x 1200 dpi. It runs at 1.485 m2 per hour, and thanks to its 8 color stations (CMYK+W+OVG) with new designed high pigmented inks, it delivers outstanding, flexo-like print quality with close to 95% Pantone color gamut coverage. In line with Durst’s commitment to helping customers “Configure Your Digital Future”, the Tau 330 RSC is available as stand-alone version or can be configured as “digital – flexo hybrid press” with OMET’s Xflex series of conventional finishing options. The result is unlimited material flexibility for a vast range of applications. Its configuration options include jumbo unwinder and material pre-treatment options like inline corona, web cleaner, priming as well as post press finishing options like varnishing, cold foil, lamination, die-cutting, slitting and rewinding. Live demonstrations by the Tau 330 RSC will highlight the range of applications possible. Also on live demonstration will be the Durst powered OMET XJet. Both systems will be distributed by OMET US in North America. The new partnership will provide label printers extended engineering capabilities, added services, and combined digital and flexo printing expertise from a single source. Furthermore the combined efforts are a natural fit of two premier brands, extends the reach of both companies in North America, and by utilizing OMET’s Chicago, IL office provides a central convenient location for customer demonstrations and faster sample turnaround time. Durst has appointed Richard Thomas, formerly Business Development Manager for North American Label Segment, as the newly titled Director of North American Digital Business Initiative for Labels and Package Printing. Brixen, Italy – 16/07/2018 - Durst Phototechnik AG and ColorGATE, one of the world's leading manufacturers of future-oriented digital production technologies, are pleased to announce their exclusive distribution partnership for the ceramic industry. A perfect symbiosis of software and hardware for further development, sales and service of the first complete solution for digital tile decoration. Manufacturers of ceramic tiles can now not only benefit from the proven quality of the Durst Gamma series, but thanks to the integration of ColorGATE's Ceramic Productionserver (CPS) also from an optimized workflow, accurate color rendering and highly efficient and color-consistent reproduction of existing wall or floor tile designs. The first jointly achieved results of the cooperation, which has now lasted for almost two years, can be found in version 10.30 recently released by ColorGATE. Numerous functions and work processes have been optimized and specifically developed for the needs and conditions in ceramic tile production. Thus, the CPS meets the specific requirements in tile decoration even better and also allows an easy and efficient use of the professional color management tools. By providing drivers for all devices of the Durst Gamma series for direct communication between CPS and printer, all relevant settings such as resolution or line speed for each job can be automatically transmitted with the print job. This not only provides the customer with outstanding print quality, but also an optimized and secure workflow experience. Of course, the Universal Ceramic Inkjet driver can also be used with all other Non-Durst ceramic digital printers available on the market. Durst is responsible for the technical support and training, ColorGATE will concentrate on 2nd-level support. "After we presented our range of solutions for color consistency in digital tile decoration, consisting of the RSC colour measurement solution and the Ceramic Productionserver, at the last Tecnargilla, the technical discussion with the specialists of Durst Phototechnik AG as pioneer and technology leader led to an enormous further development of this complete solution. With Durst, we are pleased to announce an exclusive distribution partner that gives customers and interested parties worldwide access to this innovative range of solutions," says Thomas Kirschner, founder and CEO of ColorGATE. Norbert von Aufschnaiter, Head of the Ceramics Printing Division at Durst, adds: ColorGATE's range of solutions with the innovative and patented RSC color measuring system is the first "True Ceramics" color management solution developed and optimized especially for ceramic colors and process conditions in tile production. For the first time, this enables fast, simple and precise color matching in tile production with just a few steps, rapid production repetition with greatly reduced test runs and thus ensures minimum downtimes and an efficient workflow for various printers (Durst and Non-Durst printers) and production facilities.